Stainless steel kitchen utensils and appliances are widely used in the hotel kitchen appliances, household appliances, because of the use of stainless steel kitchen utensils and cooking with intake of trace chemical elements. Research shows that the food cooked in stainless steel tableware, the microelement such as iron, chromium, manganese content than other high pot cooking. And ordinary food, these trace elements of human body if lack of one or several, will cause harm to health. Therefore, the rational use of stainless steel tableware are beneficial to human body health. However, many metal elements such as chromium, molybdenum and manganese and its compounds if excessive intake and can lead to different degree, different nature to human body health damage. The user lacks the knowledge of the use of stainless steel tableware, can make the stainless steel of trace elements in human body slowly accumulated, when accumulated to a certain extent will cause bad influence to health. 1. Not long bloom salt, soy sauce, vinegar, soup, etc. Because these foods contain a lot of electrolytes, if long time and stainless steel will also like other metals, and the electrolyte electrochemical reaction, the toxic metal elements are dissolved out. 2. Avoid by all means use stainless steel pot boil Chinese traditional medicine. Because of traditional Chinese medicine (TCM) contains a variety of ingredients including alkaloids, organic acids, especially under the condition of heating, it is hard to avoid does not react with the and disable drugs even generate some toxic compounds. 3. Do not use strong alkaline or strong oxidizing chemicals such as soda, bleaching powder, sodium hypochlorite and other washing. Because these substances are strong electrolyte, same meeting to electrochemical reaction and stainless steel. 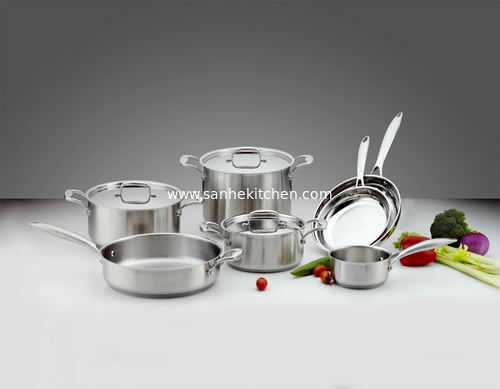 Dalian SanHe Trading company is a professional of stainless steel kitchen utensils, the main products include stainless steel pressure cooker, stainless steel composite bottom soup pot, sauce pan, frying pan, fry pan, stainless steel cutlery etc. If Interesting in the above products, welcome to consult us at any time.